Dr Scott Davis is a prosthodontist who graduated in dentistry and has a doctorate in restorative dentistry. 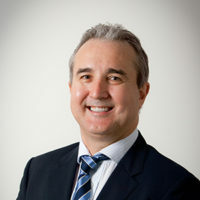 Based on the NSW North Coast, he specializes in prosthodontics including implant prosthodontics, complex rehabilitations and maxillofacial prosthetics. He has lectured on implant prosthodontics and treatment planning in all states of Australia and overseas. For more than 20 years dentists and dental laboratories have been using Computer-Aided Design/Computer-Aided Manufacture processes in manufacturing various dental prothetic devices and restorations. That is to say we can design crowns and bridges, surgical guides and a range of other things on a computer rather than being carved from wax and cast from metal or resin manually. That process involved what is known as subtractive manufacturing, that is milling or grinding a solid piece of material into the desired shape. Recently there has been a growing revolution in additive manufacturing. Additive manufacturing is the creation of an object from a liquid or powder through using 3D printing technologies. It is hard to imagine how a printer can print in 3D, it does this by printing multiple very thin layers one on top of the other. The cost of 3D printers has dropped dramatically in the last two years from prices ranging between $100,000 and $1 million down to the cheapest being about $8,000. That means even small dental offices or laboratories can now realistically afford to own and operate a 3D printer. From a consumer’s perspective this trend will allow for many items to be made locally rather than by centralised manufacturing which should allow for faster manufacture at a lower price. Just as importantly the range of materials that can be utilised by the printers has expanded significantly allowing for more diverse applications. This trend is expected to continue with exciting new materials soon to be available. At present surgical guides, bite splints, dentures, orthodontic aligners, dental models and more can be created through printing. From a consumer’s perspective this trend will allow for many items to be made locally rather than by centralised manufacturing which should allow for faster manufacture at a lower price. This probably will first be apparent in orthodontic aligners for straightening teeth. Rather than having to wait weeks for them to be made in the United States for several thousand dollars they could be made locally for several hundred. More people manufacturing products means more competition on both price and speed of manufacture. Printing makes it possible for more complex shapes to be made than could be created with the milling and grinding of subtractive manufacturing. Also where milling can produce one item at a time, printing can produce up to 20 items simultaneously. This will also put downward pressure on manufacturing costs which hopefully will be reflected in the final cost to consumers. Dental fees have increased just below the CPI for over five years now, a fraction of the fee increases of health insurers, however to maintain this trend technological advancements are needed to reduce our input costs. Several technologies are used by 3D printers: Stereolithography, Digital Light Projection, Fused Deposition and Selective Laser Sintering being the main options. Laser sintering is generally utilised for printing metals and is very expensive whereas Stereolithography and Digital Light Projection are widely used with polymers (plastics). Stereolithography, patented in 1984 by the American pioneer of 3D printing, Chuck Hall, is a method for 3D printing that cures layers of photo-sensitive polymers with ultra violet light lasers. Stereolithography represents the majority of 3D printers in dental laboratories today, and newer versions can also print in two or even three different materials simultaneously. Faster, cheaper, precise and predictable. In a few years this technology will become so common place that dentists will wonder how they ever worked without it. Chuck Hall also contributed the stereolithography STL file format for three-dimensional objects. Briefly, STL is to 3D what JPEG photographs are to 2D. You are probably familiar with understanding dots per inch (DPI) for 2D printing, which is the resolution in the X-Y plane, while 3D printing adds the Z plane. Typically the vertical Z plane layers are 0.05 to 0.1 mm. The thinner the layer, the greater the precision of the object created, but the time taken to print is longer. The big change in recent years is the speed of manufacture. Where budget model printers take several hours to print dental models, machines such as those using Visual Form 4 technology can do it in 15 minutes or less. Being able to produce precise temporary crowns and bridges in seven minutes for example, is a potential paradigm shift for dentists. Or if you lose your denture a replacement denture could be made while you wait from the data collected when it was first made.